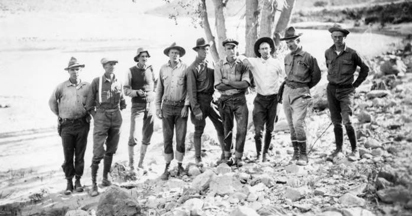 USGS survey in lower Cataract Canyon in 1921, which is now buried in Lake Powell sediment. The Colorado River is a story more about sediment than water. There is a saying on the Colorado about it's sediment load: "Too thin to plow, too thick to drink." By volume, the Colorado River is the most sandy and silty river in North America. By volume of water, the Colorado ranks 25th in the 50 states of the USA. However, this tiny river has eroded half of the Colorado Plateau in as little as 6 - 10 million years. Indeed, quite an accomplishment and a testament to the power of grits both fine and course. Once you read some of the key documents (example) in this section, you will understand that sediment will interrupt water supplies to the water users of the Colorado River in as little as ~250 years. "Our rivers run silt, although we could better think of them as running the telltale blood of cancer." Alan Gregg. Sediment Studies In Lake Mead Publications. USGS. 1916 - Silt Problem. LaRue. 1929 - Sediment Upper Colorado. Follensbee. 1947 - Science Against Silt. Leopold. 1947 - Suspended Sediment in the Colorado River 1925 - 1941. Howard. 1953 - Hydraulic Geometry of Stream Channels and Physiographic Implications. Leopold et al. 1954 - First Fourteen Years at Lake Mead. USGS. 1961 - Design features of Glen Canyon Dam. Bureau of Reclamation. 1966 - Letter from David Brower to Morris Udall. 1968 - Sedimental Journey. Brower. 1976 - Alterations of Terrace Deposits and Beaches of the Colorado River in Grand Canyon. Alan D. Howard and Robert Dolan. 1976 - Hydrology and Sedimentology of the Colorado River in Grand Canyon. Emmett M. Laursen and Elliot Silverston. 1994 - San Juan Silt Story. Baars and Stevenson. 1996 - Surficial geology of the Palisades area in Grand Canyon. Hereford. 2001 - Origin of Colorado River experimental floods in Grand Canyon. Andrews & Pizzi. 2002 - Report to Congress: Grand Canyon Protection Act. Secretary, Department of the Interior. 2002 - Recent Sediment Studies Refute Glen Canyon Dam Hypothesis. Rubin et al. Eos. American Geophysical Union. 2003 - A Colorado River sediment inventory. Weisheit. 2005 - Chapter One on sediment resources in Grand Canyon. USGS Score Report. 2005 - Sediment Chemistry of Colorado River at Delta of Lake Powell. Hart. Sediment response to construction and adaptive management at Glen Canyon Dam. Booth. 2007 - Sediment Augmentation Feasibility Report. Randle. Bureau of Reclamation. 2008 - Is There Enough Sand: Evaluating the fate of Grand Canyon sandbars. Wright et al. Geological Society of America. 2008 - Holocene debris flows on the Colorado Plateau. Webb et al. 2009 - Fluvial Systems Tied Together Through a Common Base Level: The Geomorphic Response of the Dirty Devil River, North Wash Creek, and the Colorado River to the Rapid Base Level Drop of Lake Powell. Majeski. 2010 - Sedimentation and Sustainability of Western American Reservoirs. Graf et al. 2010 -Sandbar Response in Grand Canyon following 2008 High-Flow Experiment.Hazel et al. 2010 - 2008 High-Flow Experiment at GC Dam - Morphologic Response of Eddy-Deposited Sandbars. Grams, et al. 2010 - Hoover Dam Scientific Studies. Rodgers. 2011 - Effects of three high-flow esperiments on the Colorado River ecosystem downstream of Glen Canyon Dam. Melis et al. 2012 - Effects on River Regulation On Aeolian Landscapes Colorado River Southwestern USA. Draut. Colorado River near Arches National Park (Mouth of Salt Creek). 2008 - Is There Enough Sand (Grand Canyon). Wright et al. 2011 - Effects of Three High-Flow Experiments on the Colorado River Ecosystem Dowstream of GCD (USGS Circular 1366). Melis et al. 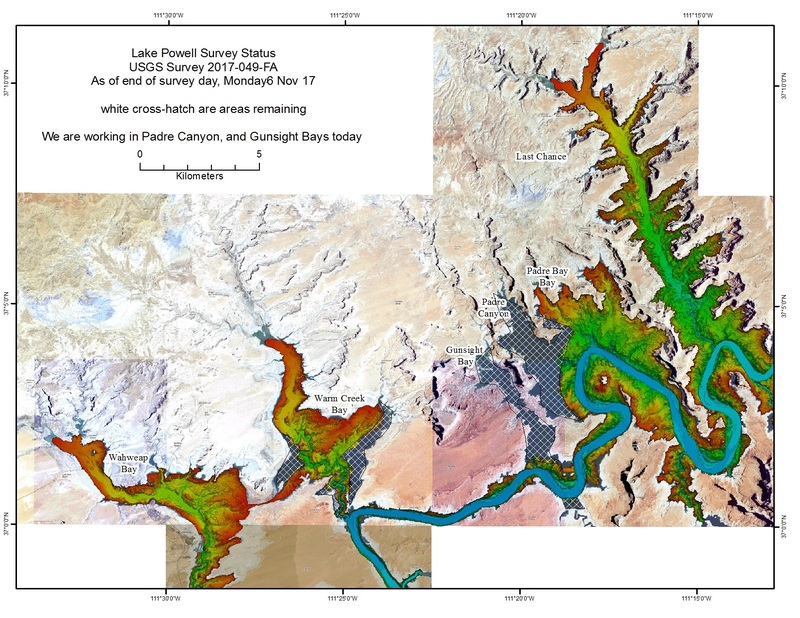 Lake Powell Sediment Status 6 Nov 2017. USGS.